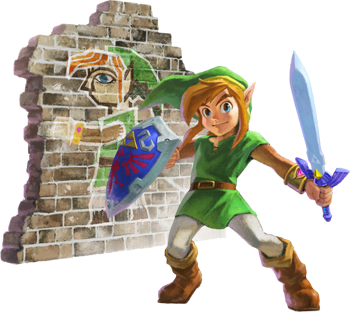 The Legend of Zelda: A Link Between Worlds's puzzles had to be adjusted for 2DS players. When we first heard about The Legend of Zelda: A Link Between Worlds, one of the things Zelda series producer Eiji Aonuma stressed was the game's heavy use of the 3D effect. In particular, a lot of the game's puzzles will make use of 3D, and will be much easier to solve and navigate with the 3D turned on. So, when Nintendo announced the 2DS, it may have made Zelda fans wary of how the game will run on the non-3D platform. Not to worry, says Aonuma, as the game's puzzles were tweaked when they heard about the 2DS. He stresses that "It's not that you can't play it with 2D, it's just that it becomes clearer when you have the 3D effect on." Aonuma explains that "We found out about the 2DS during development, not before, and we also made changes so that we were sure that you could still play and solve the puzzles only with 2D. It's definitely still playable in 2D." Despite this, Aonuma is of the opinion that gamers who are playing on the 3DS should definitely take advantage of the 3D feature. He says the team has put in a lot of effort to ensure that the game still runs at 60 FPS, even with the 3D turned on. "A Link Between Worlds is being developed with 60 frames per second, and previous Zelda titles were about half that, about 30fps. The reason for this is because the 3D effect is much more stable with a higher frame rate, with the 60fps. If it's lower than it's sometimes hard for your eyes to focus on the appropriate image. We think we've created a game that even those who found it difficult previously to see the 3D effect would be able to see it better and enjoy it more with this title." Aonuma also announced that upon completing the game, a higher difficulty "new game plus" would be unlocked.